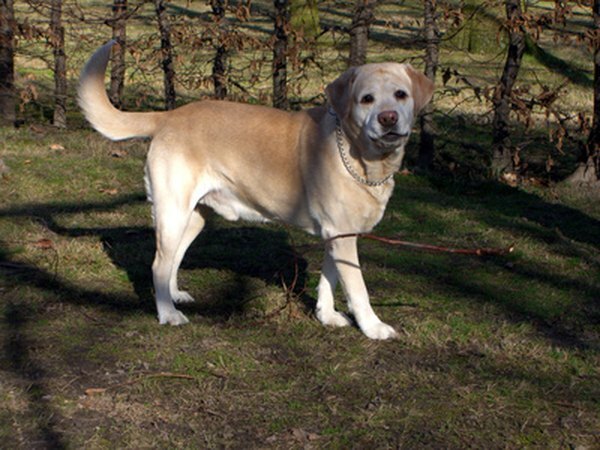 Labrador retrievers are highly active dogs who love busy households. Keep your Labrador retriever exercised. Digging expends energy in this breed; if he is walking and playing vigorously throughout the day, he doesn't have the energy needed to dig up the yard. Besides running in a fenced-in yard or playing fetch, make him work for a treat -- such as digging it out of toys -- or allow him to play with other friendly dogs. Keep the Lab mentally stimulated so he doesn't get bored and begin to dig. A new toy that requires some thinking to use can keep him occupied. If he is alone during the day, a dogwalker or "doggie day care" facility can keep him occupied and seeing new things. A hard plastic child's pool allows him to play and cool off in his own water toy; throw a few floating toys in to grab his attention, as well. Make sure your pet is comfortable, and not digging out of a desire to reach cooler ground. Some labs who find heat too oppressive dig a trench simply to lay in a hole to lower body temperature. If the dog is doing it in colder temperatures, it may be out of a desire for a wind buffer or to stay warm. Create a specific area of the yard -- such as a sandbox or old flowerbed -- where your Labrador retriever is allowed to dig. This requires patience and training to make him understand that this is the only spot where digging is allowed. Squirting him with a hose when he goes elsewhere can assist in teaching him that digging anywhere else is not tolerated. Throw a few of his toys in this area, or a Kong filled with treats, to give him the idea that this is his playground. The additional benefit to a well-exercised Labrador retriever is good health; dogs who do not exercise enough are prone to health issues such as obesity and heart problems. Excessive digging can also be a sign of stress, which could be from outside factors -- such as a new family routine or pet in the house -- or internal factors, such as failing health or old age. Ceasers Way: How Can I Get My Dogs To Stop Digging? Mile High Dog: How Much Exercise Does My Dog Need?